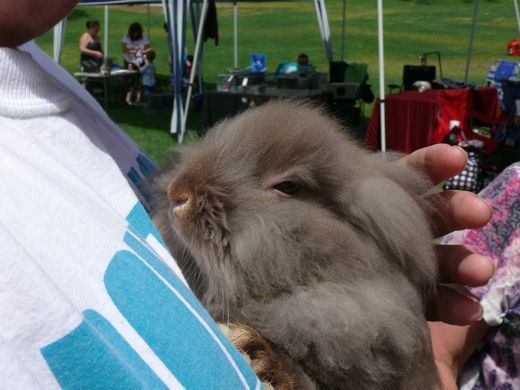 Of course we didn't technically get Sanka-nator from a rabbit show. 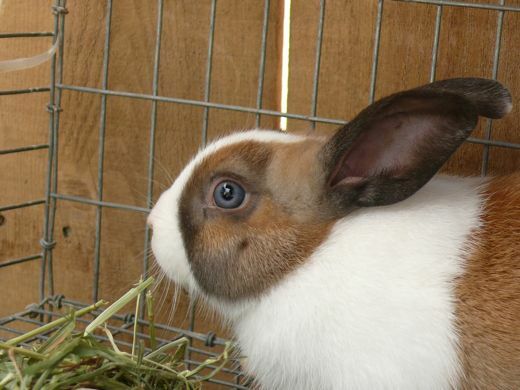 She's one of the cute bunnies we met last month, at Olivia's house. We were waiting for one of those baby bunnies to be ready to leave her momma and come to live with us at the Bird House, and were we ever excited when the day finally came. Sanka-nator is named after a brown and blue eyed pig who went by the name Sanka. Notice? One brown, one blue? 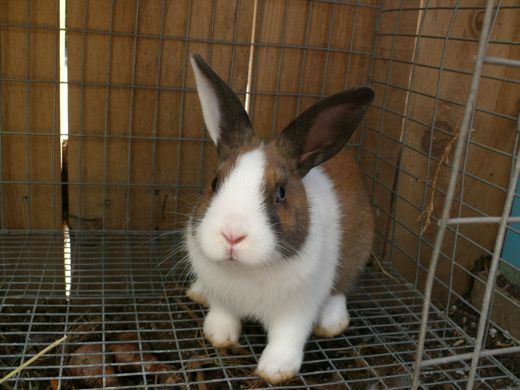 A rabbit named after a pig, with "nator" tacked on, because... well, maybe living in a state governed by The Terminator has that affect. I did wonder if Maria would want to name her herself, but she insists that Sankanator is the name, for keeps. Brown eye, pink nose, blue eye, and totally sweet. 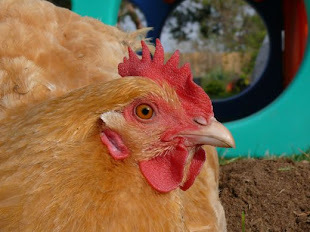 She likes to be pet, and Maria has no trouble scooping her up for a snuggle. 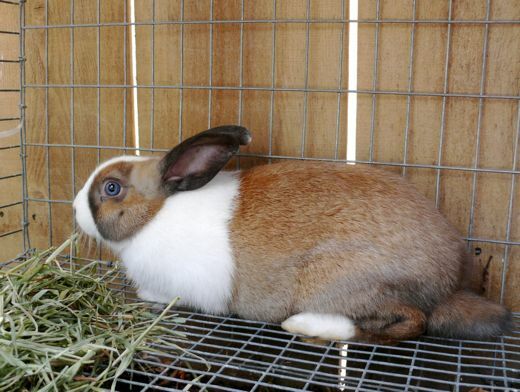 Apparently her markings do not qualify her for "showing," but we show her all the time and everyone has judged her to be a good bunny, a darling bunny, a welcome to our home bunny. 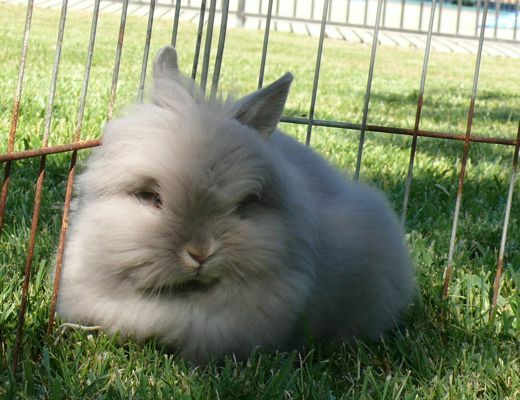 Yes, this is the Lioneheaded dustbunny that won Alex's heart. And mine. And Geoff's. Oh, and Maria's heart, and William's, Max's too. 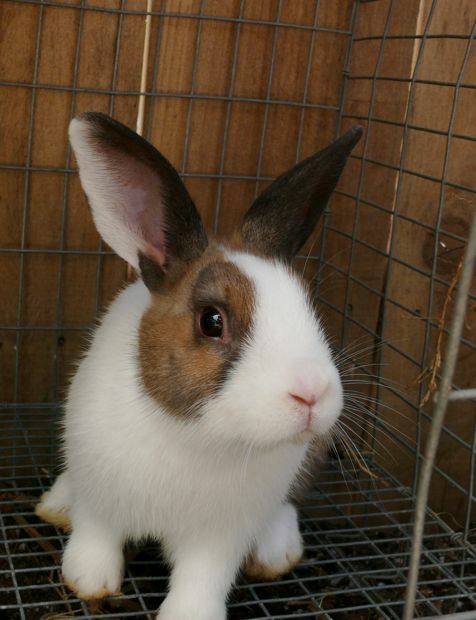 Yes, it is unanimous: Professor Moriarty is the unexpected, and irresistible, heart winning bunny honey of the rabbit show. And after a few minutes of this, Alex could not leave for home without the Professor. I wonder if the camera will ever be able to focus on the fine, wisps of downyness that is Professor Moriarty's signature look. His mane is almost ethereal, and it feels as soft and delightful as it looks. 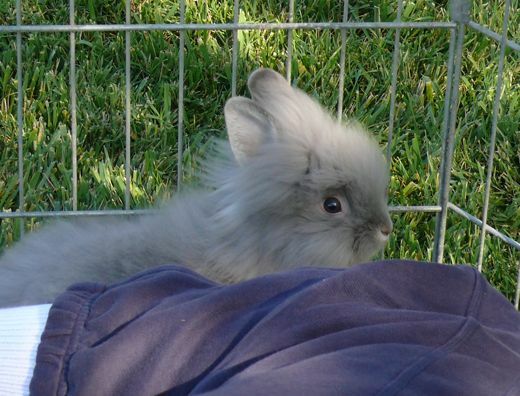 He is a bunny cloud, but with the dignity of character befitting a Professor. Where did I leave my pipe? After tea, a walk about the gardens, then back to my studies. That's the ticket. School assignment: "Make a quick hat to wear, with your name tag." Max insisted he wanted it simple, but that we was not resorting to the suggestion that they "modify a paper sack." 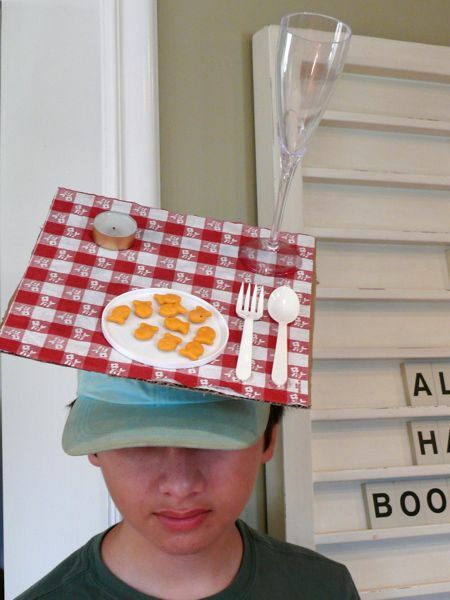 He gathered his elements from kitchen drawers, and stapled cardboard to an old hat. I love it. All the parts are glued or epoxy-ed on. Well done, Max. I raise my glass (of sparkling cider) and say cheers to Max! Bold and daring, creative, and fun Max! Is there any thing that your kids can't come up with ... LOL. Love the Bunny Love!! Give a hug to them both from me. Great hat! Clever children! Beautiful bunnies! I have to say the Professor looks like an entirely different species, hardly like a bunny at all. How can you all keep your hands off him, or do you even try? 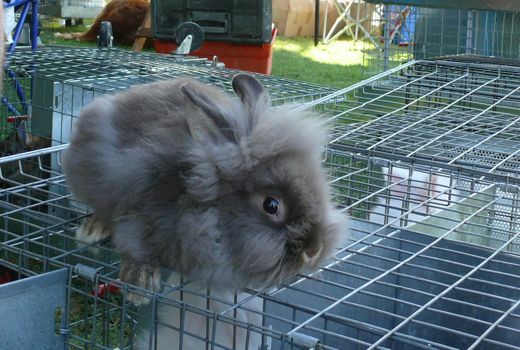 When I was in a very stressful job I used to sneak out at lunch to visit the bunnies at the pet shop down the street. Instant stress reduction, and better (and cheaper) than therapy. What is that magic that bunnies have? Those are the cutest rabbits I've ever seen! So very cuddly and gorgeous. But yours are totally irresistible! Are coyotes a worry for you there? Our little dog, Yoshi, was very nearly a snack for a coyote when we lived in Carmel Valley. More Bunnies!! : ) I just want to nibble their little noses. 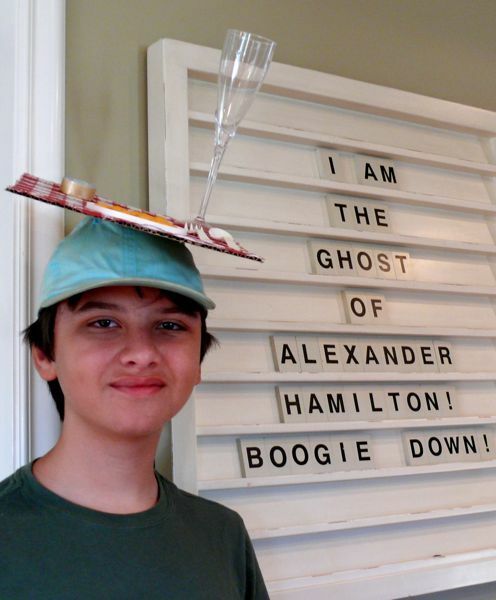 And wtg, Max, on that creative hat! We love Max's hat -- hurray for jumping on the chance to be creative, putting aside the easy-out, and showing the world a thing or two about you. Magnificient hat! We decorate hats each year for the KY Derby to poke fun at all the silly hats the women wear...I love this one and may adapt for next year's Derby!